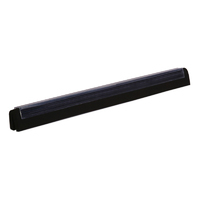 Market leading hygiene squeegees for the food and beverage industry. Removing water and condensation from floors, walls and ceilings is paramount for an effective hygiene regime in any factory or distribution hub. The KsPrism range of squeegees is available in 11 food grade colours to support segregation and hygiene control. Supple and durable rubber blades on our ultra-hygiene single-blade squeegees ensures no surface liquid is left to pool and is the tried and tested favourite of hygiene managers nationwide. Available in a selection of widths from 300 to 700 mm. Push or pull - the result is the same. 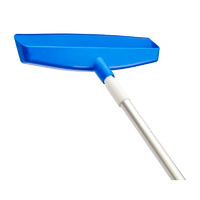 The squeegee body is designed to present a plastic blade edge when flipped through 180°, encouraging stubborn residues along with liquids. 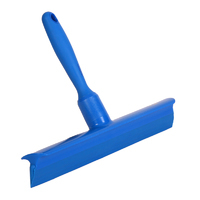 No cracks or crevices – a truly supple super hygiene commercial squeegee that will last. Available in up to 11 distinct colours. 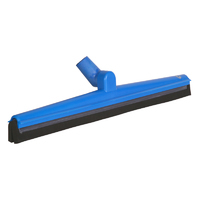 Order this highly effective, robust industrial squeegee direct from Klipspringer. 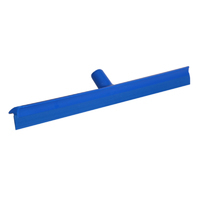 All KsPrism squeegees are compatible with our standard range of colour coded hygiene handles. If you need advice or assistance with your purchase, please call Klipspringer on 01473 461 800. All orders received by 4pm will be dispatched same day! Designed for maximum hygiene and effectiveness. Available in 10 distinct colours. Choose from 5 working widths to suit every application. Push or pull - the result is the same. Squeegee body is designed to present a plastic blade edge when flipped through 180°, encouraging stubborn residues along with the liquids. 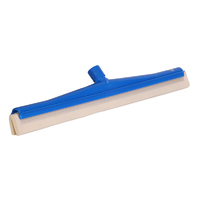 No cracks or crevices - a truly supple super hygiene squeegee that will last. Available in up to 11 distinct colours. 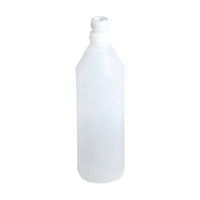 A colour coded moulded handle is matched to both polypropylene stock and leading rubber blade. Ideal for moving moisture and condensation from smooth vertical and horizontal surfaces reducing associated hazards from mould and airborne bacteria. 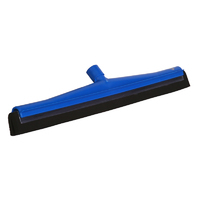 Sprung polypropylene squeegee body with inside thread boss to accept KsPrism colour coded handles. Replaceable cartridge with white soft rubber double blade. Plastic blade edge incorporated into squeegee finished article. Available in up to 7 colours. 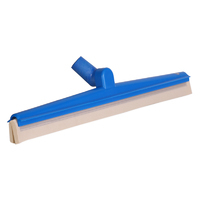 Sprung polypropylene squeegee body with inside thread boss to accept KsPrism colour coded handles. Replaceable cartridge with black soft rubber double blade. Plastic blade edge incorporated into squeegee finished article. Pivoting handle boss enables work to be carried out at varying angles, particularly useful in clearing below immovable equipment or working at extreme operator reach. As with fixed squeegee, the replaceable blade cartridge is firmly held in place by the sprung moulding. Available in 4 colours. Pivoting handle boss enables work to be carried out at varying angles, particularly useful in clearing below immovable equipment or working at extreme heights above operator. As with fixed squeegee, the replaceable blade cartridge is firmly held in place by the sprung moulding. Available in 4 colours. Double blade squeegee refill cartridge.